Brian Kavanagh, Chief Executive of Horseracing Ireland and Chairman of the European Pattern Committee, during an address at the Asian Racing Conference in Hong Kong this morning, called for uniform international rules relating to medication. Session chairman William A. Nader, Executive Director, Racing of the Hong Kong Jockey Club, makes his presentation to attending delegates. 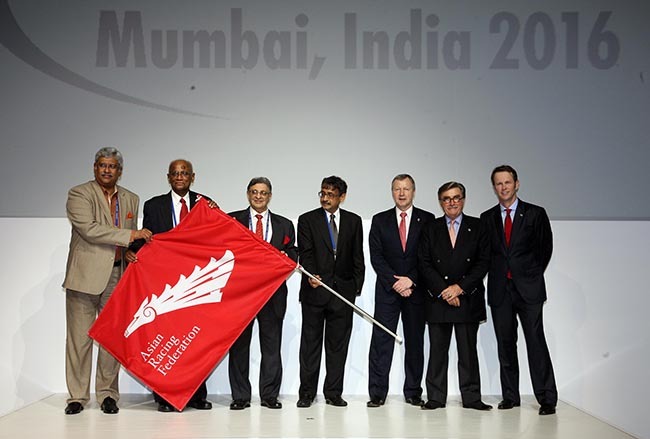 “I believe that the IFHA (International Federation of Horseracing Authorities) must move to a single worldwide set of rules relating to medication and we simply must find a way of ensuring that these rules can be enforced in all member countries,” said Mr Kavanagh, who was speaking in the context of ensuring the integrity of the Longines World’s Best Racehorse Rankings, and, by extension, all Pattern races. A live electronic poll of delegates attending the session revealed that 82 per cent were in favour of standard medication rules being linked to the Pattern system. Mr Kavanagh’s presentation, during the session titled: ‘The Pattern: Now and in the Future’ and delivered on the first morning of the 35th Asian Racing Conference, outlined the development of the Pattern race system since its conception in England in the1960s and its initial implementation in 1971 under the administration of the European Pattern Committee. He told those in attendance that the European Pattern’s pyramid structure achieves a balance in protecting the quality of races, with the total number of Group 3 races exceeding the number of Group 2 and Group 1 races combined, and Group 2 races outnumbering Group 1 contests. Mr Kavanagh pointed out that the ranking system has evolved internationally so that today a group of handicappers from 20 countries assess horses around the world and agree on ratings. “The rankings are now published 10 times a year, which means that horse racing has a vehicle to promote the global rankings of its elite performers, the same as for other sports such as tennis, golf and Formula One,” he said, calling the Longines World’s Best Racehorse Rankings “a powerful marketing tool” on a global scale. Mr Kavanagh told delegates that in 2013, 146,649 Flat races were run worldwide with 3.3% of those classified as Pattern races (4,889), 1.3% as Graded/Group races (1,895) and 0.3% as Grade/Group 1 races (459). Mr Kavanagh also noted the innovative developments of major race days in recent years, such as British Champions Day, Irish Champions Weekend and The Championships in Australia, along with the Prix de l’Arc de Triomphe meeting and the Breeders’ Cup. He said that he believes the Pattern system accommodates these events appropriately. He cited the success of the decision 10 years ago to extend the Pattern programme for older fillies and mares in Europe, and said that the European sprint programme could be next to experience a revamp. 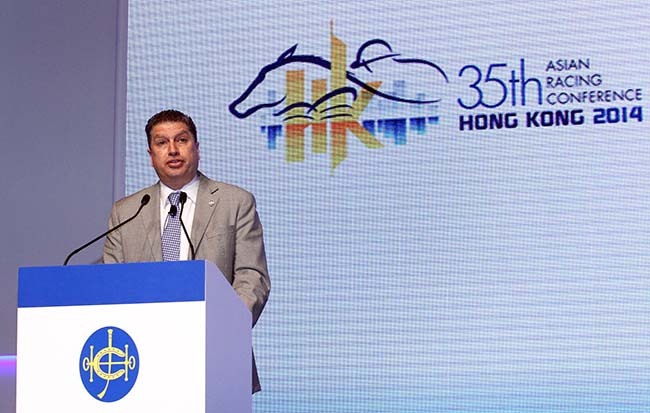 Mr William A Nader, the Hong Kong Jockey Club’s Executive Director of Racing, chaired this plenary session and aired his support for Super Group 1 races. A majority of the ARC delegates in the Grand Hall of the Hong Kong Convention Centre agreed with him, with a live vote producing 59.6% in favour of the creation of Super Group 1s and 40.4% against. The session also featured a presentation on ‘the Strategy for the Development of Racing and Breeding in Saudi Arabia’, given by Adel Almazroa, General Manager of the Equestrian Club of Riyadh, who pointed out the growth of racing and breeding in Saudi Arabia. The number of foals born in 2013 was 1,473 as against 723 10 years previously, while there are also more races and higher prize money. To boost quality, a number of import criteria were introduced two years ago and the average rating has improved. There is now a three-year plan to boost quality further.